Merz, a global leader in medical aesthetics, today announced the launch of Belotero® Revive, a dermal filler product containing a unique combination of hyaluronic acid (HA) and glycerol, designed to improve hydration, elasticity and firmness of the skin and to address the appearance of fine lines.1,2 The newest addition to the Belotero® dermal filler range, Belotero® Revive was designed to meet the unique needs of today’s aesthetic patients. Modern consumers are especially focused on skin quality and on minimizing early signs of aging, and they value skincare and aesthetic solutions that deliver natural-looking results – the so-called “no-filter” look. 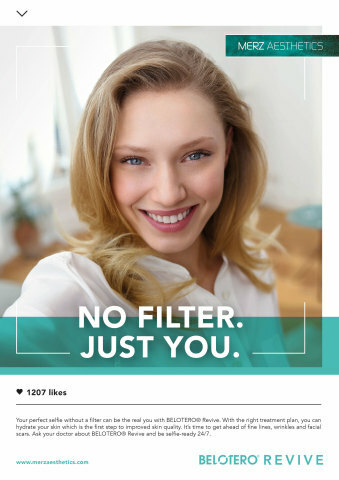 The new Belotero® Revive campaign encourages consumers to “Show off the best version of yourself, without a filter!” The campaign hints playfully at the influence of the digital sphere on real-life moments and is designed to speak to the growing acceptance of aesthetic medicine in different age groups, while encouraging female consumers to make choices that bring out their own individual and natural beauty. Belotero® Revive is now available in selected countries in Europe and Latin America, with additional markets to be added later this year. For more details, please visit BeloteroRevive.com or follow @Merz_Aesthetics on Instagram. Belotero® Revive builds upon the success of the well-established Belotero® range, which includes a wider selection of fillers which can correct imbalances and facial volume-loss, define contours, lift, volumize, fill lines and wrinkles. More information about the full Belotero® range is available at global.belotero.com.